Obituary – Gatewood, Emmarie (Ritthaler) « Perry High School Alumni Association, Inc.
﻿Former Perry resident Emma Marie (Ritthaler) Gatewood, 83, Wyandotte, Okla., died Thursday, Jan. 20, 1994, at the Miami, Okla., hospital. Funeral was Monday at the First Christian church at Seneca, Mo. Burial was at the Seneca cemetery. A memorial has been established to benefit Home of Hope in Vinita. 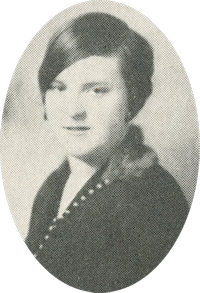 Mrs. Gatewood was born at Perry, Dec. 6, 1910, the daughter of Frank F. and Alice (Barnes) Ritthaler. She attended local schools and was a graduate of Perry high school and Central State university. She and Raymond Gatewood of the Perry community were married on May 10, 1931. Mrs. Gatewood taught in Perry area schools prior to her marriage and later was a special education teacher at Vinita for 14 years. She was a member of the First Christian church of Perry prior to transferring membership to the church in Wyandotte. In addition to her husband, who is a nursing home resident in Seneca, survivors include five sons, Tom, Jim and Billy, all of the Wyandotte area, Larry, of Miami, Okla., and Bob, of Houston; two daughters, Alice Boman, Springfield, Mo., and Linda Foster, Drumright; numerous grandchildren and great-grandchildren, one brother, Richard Ritthaler, Elk City; and a sister, Mary Ellen Smeller, Austin, Texas.